This is week 8 of a weekly art journal based on guides provided by Dale Anne Potter. All pages of this art journal are based on a tag created from card stock. Identify five places you would like to visit. This week’s art journal tag was once again started by applying gesso and a wash of water colour. This time I added additional surface detail by scattering course salt over the watercolour which was puddling in places on the rough gesso surface. It was almost a shame to cover it up. I loved it! 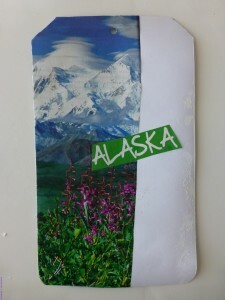 I used some travel magazine and brochure clippings to indicate some of the places I would like to visit. Naming five places doesn’t cut it for me! I love to travel and am always game to visit new places. To the five on this tag, add Australia, New Zealand, many of the South American countries, China, India, African countries……..
An initial post about this art journal project can be found in my blog.